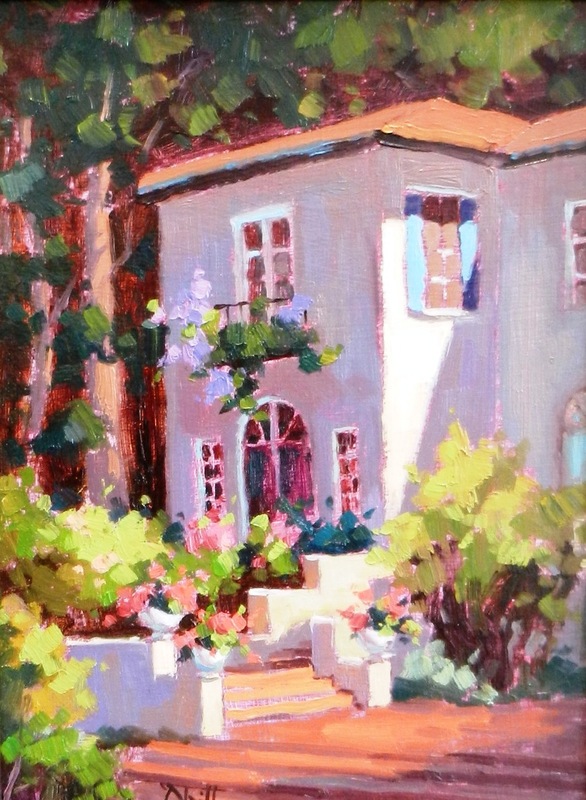 Celebrating First Friday with work by our most popular artists. 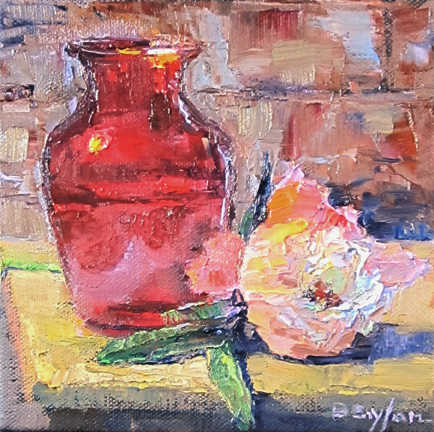 Back in the Gallery with new work are Michael Orwick and Brenda Boylan. 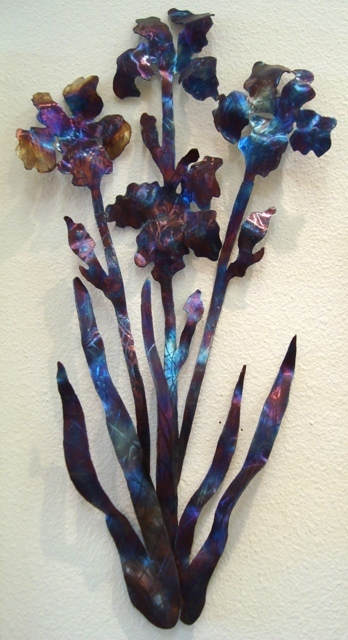 Get a closer look at new work by Rip, including sculptures from his “Simply Wild” series. Be sure to visit Ali Peret in his studio. Ali has a vast selection of fine gold jewelry and gemstones, as well as gorgeous selection of cameo carved glass vases. If you’ve always wanted to design a custom piece of jewelry, be sure to talk to Ali. Ali has been based in Troutdale for 23 years. 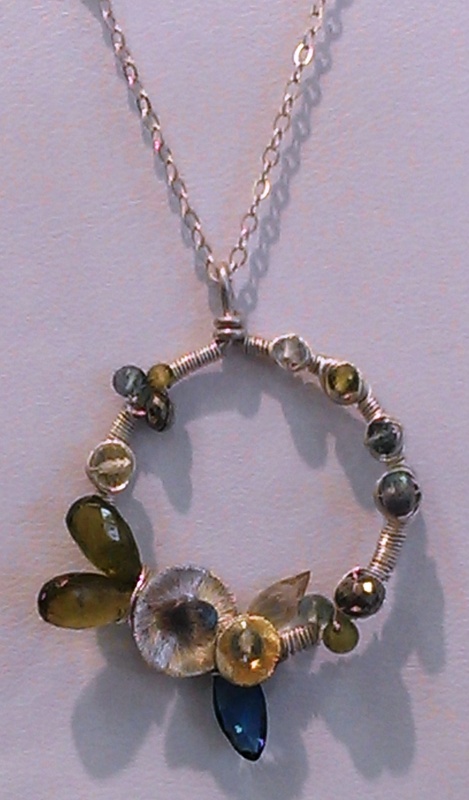 We also have new jewelry in the Gallery by Katie Hovis of Whimsy. Don’t forget, Christmas is just around the corner! First Friday festivities in the Gallery include FREE wine tasting with Phelps Creek Vineyards. Vocalist and guitarist Bryan Arakelian will entertain. We have lots of ideas for Christmas gift giving, including jewelry, pottery and wood. Take advantage of our precast opportunities for Rip’s “Simply Wild” miniature sculptures. They are selling fast, so don’t miss your chance to reserve one of these adorable pieces. Aspiring sculptors. . . Sculpture 101, “Clay to Bronze” at Caswell Gallery and Firebird Bronze is about to start on November 11. 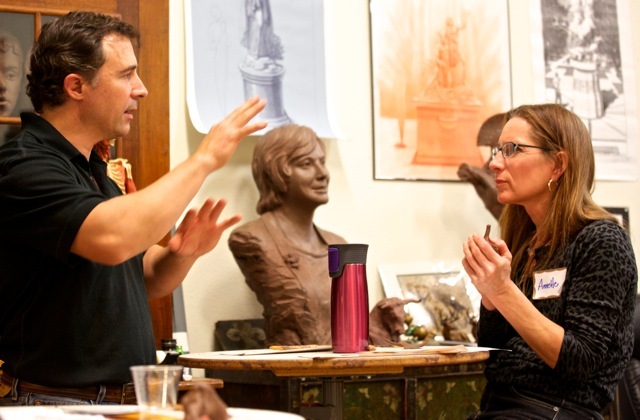 This is a unique opportunity to experience a class where Rip will coach and critique your creation from sculpting the clay through adding the patina. You will begin working in Rip’s Studio at Caswell Gallery in Troutdale and finish your piece at Firebird Bronze Foundry in Boring. Dates and Times: Starting November 11, running through December 9. There will be no class on Thanksgiving, 11/28. 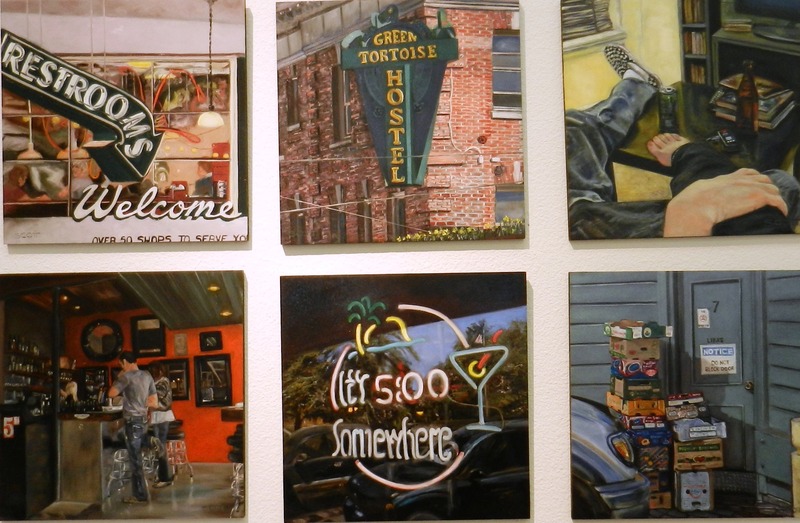 Monday and Thursday evenings, 6:30-8:30 p.m.
Students will have the option of exhibiting their sculptures in the Gallery during the First Friday Art Walk. This is a great opportunity to mingle , present and promote your art to our clientele. You will also receive a Certificate of Completion from Rip and Firebird Bronze. Click here for more details. 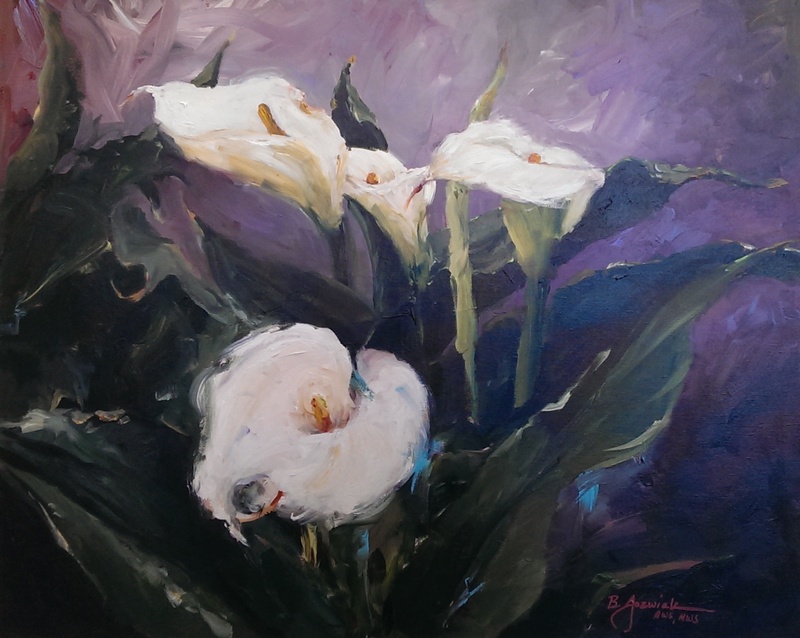 To register for this class call the Gallery at 503-492-2473. Rip will be participating in the West Columbia Gorge Fall Studio Tour this coming weekend, October 19 and 20, 2013, with an opening reception on Friday, October 18, 6-9 p.m. 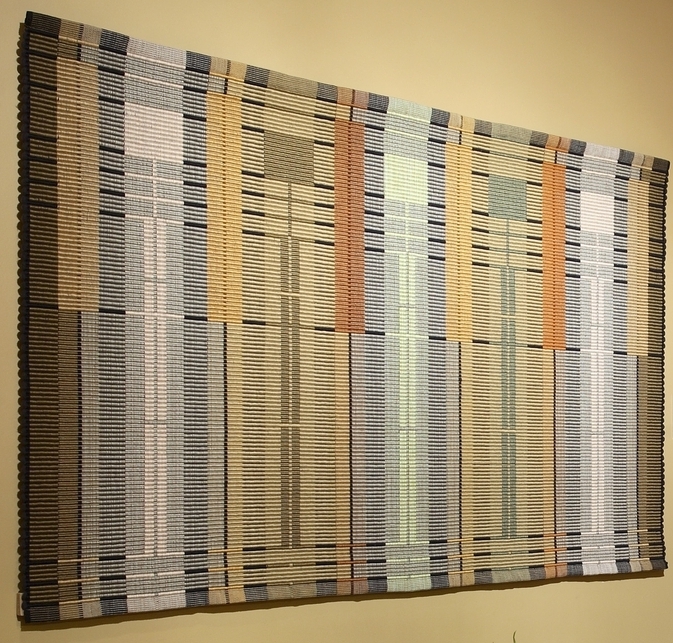 The opening reception will be held at the Exhibition Gallery at 360 Wanapa St, Cascade Locks, OR. At the opening reception you’ll be able to see samples of each artist’s work, meet the artists, and pick up your map. This will be a great opportunity to enjoy the Columbia River Gorge ad visit participating artist’s studios at the same time. Of course, Rip will in his studio, too, so make us your first stop! The 2013 Fall Foliage Stu dio Tour event is a free, self-guided event sponsored by the West Columbia Gorge Chamber of Commerce. See Mother Nature’s finest work as she and artists throughout the area create with the magic of nature and inspiration! Enjoy a historic and spectacular scenic journey as you experience our communities and meet the artists who live and create here. Awe-inspiring views will surround you as you meander through the Gateway to the Columbia River Gorge visiting the artists as they work in their studios! Artists’ studios will be open 11am-5pm daily both Saturday and Sunday, October 19 and 20. The Exhibition Gallery closes Sunday, October 20, at 5 pm when the “People’s Choice” award will be announced. 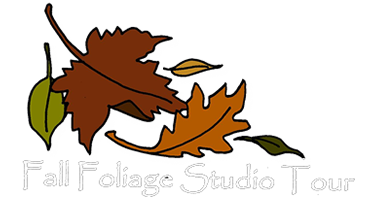 To raise money for subsequent studio tours, each participating artist has created and donated a leaf-themed piece of art. The pieces will be displayed at the Exhibition Gallery all week and final bids will be accepted until 9 pm on October 20. Sometimes, or maybe most of the time, we purchase art, find a place to display it, then forget about it. We don’t always think about “fall or spring cleaning” these valuable and precious pieces, but a little attention will go a long way to insure their longevity and appearance. Regarding paintings. Hopefully your paintings, in any media, are not hanging in direct sunlight. Sunlight may fade watercolors, drawings, textiles and ink, and may also yellow the white areas of the paper. Heat from the sun (or other sources like heat vents) can compromise the integrity of the paints. Changes in heat and humidity can cause paper to buckle and stretch and once this happens, the damage could be permanent. So maintenance tip #1: Be sure you art is placed in a neutral climate zone of your home; out of direct sunlight, and away from heat and moisture sources. The only exception to this might be glass, pottery and some metal. Always ask about the best way to display your art when you purchase your piece. Once that’s resolved, the rest is easy. Dust you artwork every now and then using a dry, soft cloth. Never use chemical dusting agents. If there are relief surfaces that a dust cloth can’t reach, try a clean, soft artist brush in a size suitable for the piece. 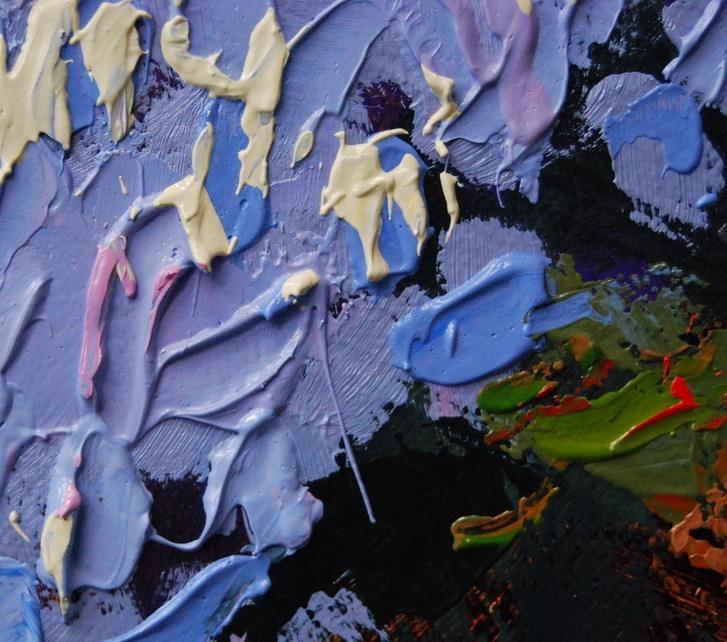 Using a brush is also great for pottery, carvings, basketry, impasto paintings—anything with a textured surface. Sometimes a brush won’t do, so a hair dryer can be a good option. Be sure to use a cool setting. A hair dryer is a great tool for “dusting” textiles and natural fiber. Aim the dryer from behind to blow the dust out of the piece. Framed art should be taken off the wall periodically and the back dusted. You would be amazed at the cobwebs that can make a home behind wall art. Glass and ceramics might possibly be rinsed with water, but be sure to line the sink with something protective in case you lose your grasp. Some basket and wicker work should be wet occasionally as part of its routine care. Should you polish metal art? That depends. If unsure only use one of the methods above or call the gallery where your piece was purchased to find out. Many metals develop a patina over time, which is often desirable. 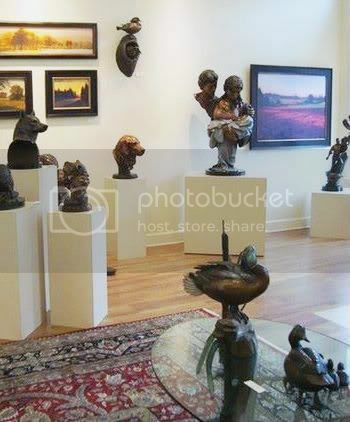 For bronze care, see our article, Taking Care of Your Bronze Sculpture. Your art is a treasure and investment that you will want to enjoy for years to come. Consider the care and keeping of your art a gesture of love! First Friday is October 4, 5-9 pm! Be sure to visit Ali Peret in his studio. Ali has a vast selection of fine gold jewelry and gemstones. 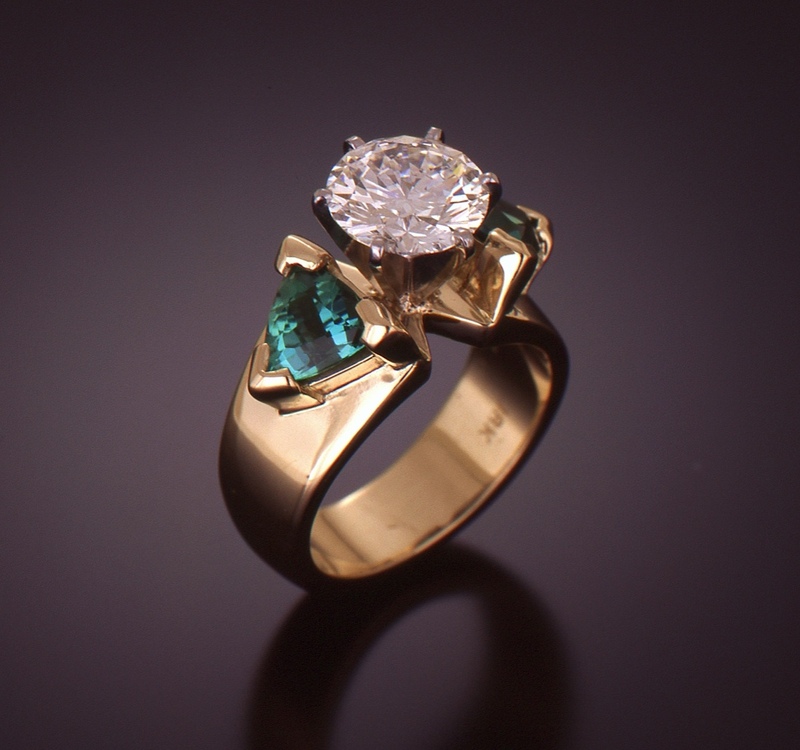 Choose from something already created or talk to him about custom designing a specialty piece. Ali has been part of Troutdale’s business community for 23 years . We also have new jewelry in the Gallery by Katie Hovis of Whimsy. Come by and start thinking about Christmas. First Friday festivities in the Gallery include FREE wine tasting with Phelps Creek Vineyards. We have jewelry, pottery, wood and other wonderful work by local artists! 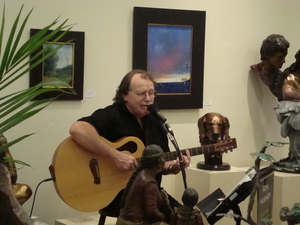 Enjoy the smooth sounds of Ron Hughes on his baritone guitar as he plays and sings favorites from the 60’s and 70’s.